Copyright@All Rights Reserved Ryokan-Sawaki Co.
We stayed as part of our journey over the Shimanami Kaido.The staff were very good, and the seafood was the best ever. I forgot to hand back the key, and they paid for it’s return from my next hotel. The staff was extremely friendly and helpful. The room was absolutely beautiful. Everything was clean.The food was exceptional. It was the best meal I’ve had in Japan.Well worth the expense. From the moment we arrived at the place, we were warmly welcomed. Although we did not speak Japanese and they did not speak much English, we were still able to understand each other and had a pleasant stay. We have cycle parking space. Also, we can keep your bicycles inside the building. 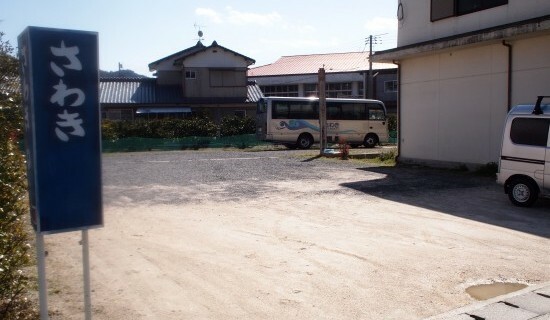 We have transportation service in Omishima, in case you have bicycle. Please feel free to ask. WiFi wireless LAN facilities are available in all rooms and the lobby areas of the hotel. Large stone lantern is the mark. It’s located in 3minutes from Oyamazumi-Shrine on foot. It’s across the street from main entrance. You can use Laudry and Drier anytime. cash, PayPay and Alipay . *there are more room types. We are proud of its fresh small fish and shellfish dishes using fresh fish from the Seto Inland Sea like red and black sea bream, black rockfish, flat fish, turban shell, etc. We have a specific thought about selection of fish. They purchase fish at different ports depending on fish on Omishima or neighbor islands. 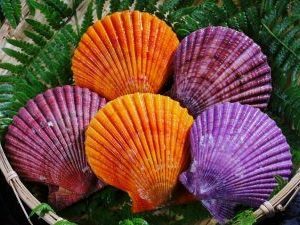 Enjoy their specialty seafood dishes. Japanese-Style Room. You can use Free WiFi in the room. Some rooms have their own bathroom and toilets. If you have any requests, please feel free to ask us. *The room may differ slightly from the actual photo. The room is different each. 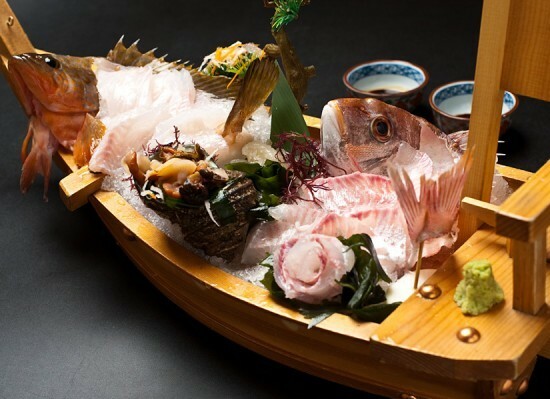 First course uses the higher grade food and sashimi will be served with “funamori” style in which sashimi is placed in miniature wooden ship. 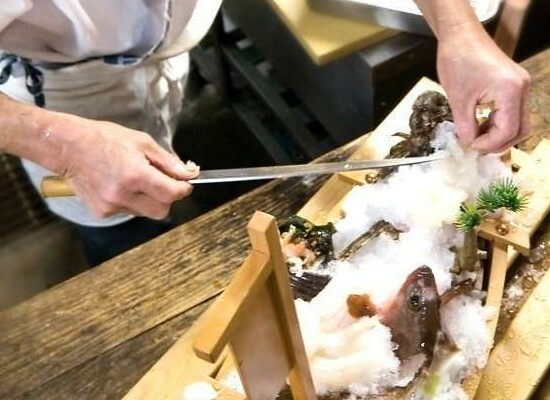 The biggest characteristic of the Deluxe course is sashimi of Ise lobster. Of course, sashimi will be served with ”funamori” style. The highest grades of food materials are used. 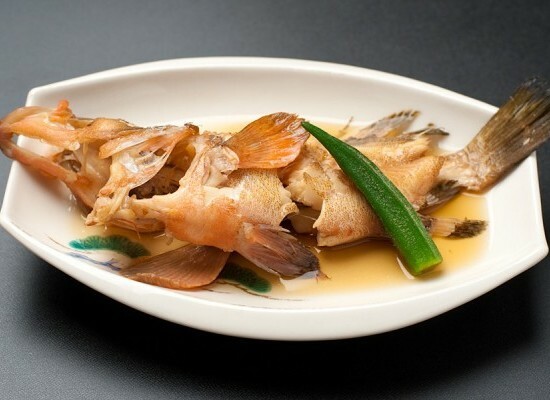 You can fully enjoy the best of the Seto Inland Sea dishes. Omishima is located in the middle of Shimanami-Kaido,So it’s convenient for cyclists. The shrine is dedicated to the services for Oyamazumi no Okami God, brother of the Amaterasu Omikami god.The guardian deity for marine safety has been respected as the Japanese tutelary deity since ancient times keeping safe the whole national costal land of Japan. National Treasure Hall holds a fine collection of ancient samurai weaponry and shrine statuary. Warriors visited the shrine to pray for victory, and the weapons and armour were offered to the shrine in gratitude for success in battle. 1,000 modern Japanese painting, prints, and bronze work are all on exhibition. The museum offers you the real magnificence of modern Japanese artists. The art museum suddenly comes into your sight on a hill in the mountains. The museum displays three dimensional art created by Noe katz, Marisol, Norichika Hayashi, and Takashi Fukai. Views from the museum are a supreme pleasure. By bus from「Tonnel-Shita」bound for「Munakata port」,get off「Tokoro Museum」. Toyo Ito Museum of Architecture is one of three extraordinary art galleries located close together on Omishima Island. The buildings are filled with architectural exhibits including books, blueprints and fascinating 3D models of structures that have actually been built around Japan. By bus from「Tonnel-Shita」bound for「Munakata port, get off「Tokoro Museum」. Cycling is a popular means of experiencing the Shimanami-Kaido. The bicycle route is well marked and maintained, and diverges from the expressway on the islands.CNN posted Shimanami-Kaido is one of the world’s most incredible bike routes. 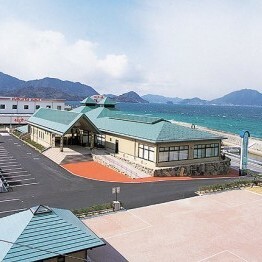 The seawater warm bath institution which took in the sea treatment. Eight kinds of baths, such as a seawater bath with mineral-rich, can be enjoyed. You can see the beautiful sunset. We have transportation service and rent bathing set. this is one of the loveliest beaches in Ehime. The sand is clean, the water is clear, and the views to seaward and landward are spectacular. Ōkunoshima is a small island located in the Inland Sea ,next to Omishima.There are campsites, walking trails and places of historical interest on the island. It is often called Usagi Jima (“Rabbit Island”) because of the numerous feral rabbits that roam the island; they are rather tame and will approach humans. Get off at Omishima Interchange/Exit then take left turn to route 317. Go along route 317 and take left turn at Imabarikita Fire department-Omishima station to route 21. A little ahead of Ooyamazumi Shrine on route 21.